A new report sponsored by EPA and Skumatz Economic Research Associates, Inc. indicates that the number of PAYT communities has grown from approximately 4,000 in 1997 to nearly 7,100 communities nationwide. PAYT has led to the diversion of 4.6 million to 8.3 million tons of municipal solid waste per year that would have otherwise been disposed of. It is also reducing communities’ impact on global climate change by reducing carbon equivalents by 2.1 million to 3.8 million metric tons per year; reducing carbon dioxide equivalents by 7.8 million to 13.3 million metric tons per year; and reducing energy use by 61 million to 108 million British thermal units per year. PAYT programs are now available in about 25 percent of communities in the United States, covering nearly 75 million residents. In the past decade, there has been an almost 70 percent increase in the number of PAYT communities. States with the largest share of communities with PAYT available include California, Iowa, Massachusetts, Michigan, Minnesota, New Hampshire, New York, Oregon, Washington, and Wisconsin, all with PAYT available in 40 percent or more of the communities in the state. Five of these states have more than 75 percent of communities with PAYT. Thirty of the 100 largest cities in the United States are using PAYT. The recent national analysis indicates that PAYT communities show a 17.1 percent recycling rate overall, compared with only 13.6 percent in non-PAYT communities. In PAYT communities, the rate of yard waste diversion is 11.5 percent, compared with 7.8 percent in non-PAYT communities. The study also found that household costs for monthly garbage services were not significantly higher for PAYT communities compared to non-PAYT communities. For more information, read the full report (PDF) (29 pp, 860K, about PDF). PAYT is growing in cities and towns across the country. 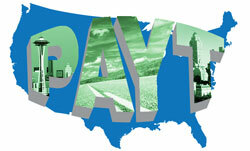 See where the latest PAYT programs and events are taking root. Increasing the city’s recycling rate from 30 percent to 43 percent in only a few months, the PAYT program in Akron, Ohio, is already showing results. “People hate the idea at first, but after living with it for a couple months they love it,” said Akron public works manager Paul Barnett, who implemented PAYT in Akron last summer. Nearby Lorain County, Ohio, is now considering a similar program that would limit residents to one standard-sized trash can per home. Seeking alternatives to the town’s $165-a-year trash fee, Stoneham, Massachusetts, may join the growing ranks of PAYT programs in the “ Bay State.” In November 2006, a committee recommended the switch, saying the system would provide an incentive to recycle and reduce household waste, as well as cut fees to $90 per household. Stoneham would join the 120 municipalities in Massachusetts that have unit-based pricing for trash collection. Penn Township, Pennsylvania, is one of 20 communities that will share more than $2.3 million in grants for their recycling efforts in 2004, awarded in early January by the commonwealth’s Department of Environmental Protection. Penn Township received special mention for its successful PAYT program. Recently featured in Waste News Magazine, Wayzata, Minnesota, is showing how PAYT can inspire communities to weed out unnecessary trash. The town has collected organics as part of its curbside recycling program for nearly four years. Food scraps, pizza boxes, paper towels, vacuum cleaner bags, dryer lint, and dead houseplants are all included in the composting effort, which has cut Wayzata’s garbage output by at least 12 percent. Canterbury, New Hampshire , recently adopted PAYT—much to the delight of EPA’s Pay-As-You-Throw program manager Janice Canterbury, happy to now share more with the New England town than just her last name. Is Canterbury, England, next in line? The two largest soft drink manufacturers, PepsiCo and Coca-Cola Company, are being asked by a corporate responsibility group to increase their beverage container recovery and recycling in the United States. The group, As You Sow, submitted shareholder resolutions to the soft drink giants in November, encouraging them to influence nationwide recycling rates that are lagging behind increased beverage sales. Showing that Coke has done its homework on solutions that work, the company issued statements indicating its support for PAYT. “To increase collection we have been focused on designing packaging with high recycling value and working with other stakeholders to promote effective community collection programs such as Pay-As-You-Throw or RecycleBank models—models achieving recycling rates of all materials above 50 percent,” said Scott Vitters, Coca-Cola’s director of sustainable packaging, explaining what the company is currently doing to improve recycling. Coca-Cola is a “huge advocate” for PAYT, Vitters stressed, dating back to the 1980s when it hosted a PAYT forum at its headquarters with EPA’s help. Although lately the company has done more work with the RecycleBank model, he said Coke is currently researching the best PAYT programs in the United States. To that end, Vitters said Coca-Cola is working on model programs that raise recycling rates by looking at what waste costs the consumers, and then introducing incentives such as PAYT, and will continue to look for ways to partner with EPA and the National Recycling Coalition.